News – Nick Falkner, author and artist. The March/April issue of Analog Science Fiction and Fact now contains roughly 2,000 words of me, talking about whether we could inspire people about education using the same inspirational approaches that introduced going to outer space and planetary exploration. This has brought a number of people past the blog and my novel from last year “The Curse of Kereves Dere“, which has been a nice surprise. I think I’ve had an extra sale! (At the rate I sell books, that’s more than a percentage point increase.) I’ve also received some feedback telling me it’s utterly stupid and some saying that they think it’s a wonderful idea. I guess that always happens when you go public. I have started working with some other academics on ways that we can provide useful information on 21st century teaching to writers; we’re looking to produce a resource that will give you the background you need to add excellent educational detail to your stories. I can’t ask you to talk more favourable about education and not support it, can I? On the writing front, I’m still slowly writing my next novel and I’m trying to get that finished soon but my day job is taking priority right now and, because I’m a University academic helping my students to get the most out of Computer Science, it’s a priority that I can’t ignore. But I promise that you’ll have “Meditations on the Vampire Republic” before the end of the year. Thank you for dropping by! Please keep following for more information on resources related to my guest editorial and news of my books. 2016 has been a difficult year for those of who us who grew up in the 80s. I’m not going to list the names of those we’ve already lost because it’s far too long and I’m starting to become a little scared that the list has enough cosmic weight to become a maleficent summoning. But we’ve lost a lot of amazing people. People who were good at what they did, people who did what they were good at, even as other people derided them, tried to constrain them, tried to make them hide their glorious eccentricities. And now Prince is gone. The quirky, brilliant, mercurial, enigmatic, and talented artist who was so clearly defined that people could post a picture of him in yellow and call him “The Purple One”. Multi-instrumentalist, composer, arranger, singer and legend. My favourite story of Prince was told by his “duty” sound engineer. Prince liked to record at all times and, as a result, he had an on on-call sound engineer to run the studio while he recorded. One night, Prince came in and put down a track based on, I think, a dream and spent hours putting down everything. He listened to it at the end but didn’t like it. He wanted to get rid of it. The engineer was a fan. He’s seen this amazing thing taking shape and he can’t believe it’s about to disappear. He suggests waiting until tomorrow. Prince looks at him, smiles, reaches over and deletes the whole thing. Because it wasn’t right and he had enough faith in himself and his abilities to do it again and, next time, get what he wanted. Or to live without it. It had to be right or it just couldn’t be. Artists have to be brave. Artists have to dare. Prince worked harder than many people I know to try and produce things that matched what he saw in his head. His craft was honed by practice and performance. His mind was enlivened by constant challenge in the pursuit of his vision. He was performing up until a month ago and he kept sharing his talent and vision with the world right up until the end. Deeply respected. Adored by fans and music lovers. Sadly missed, already. Thank you, for all of the wonderful music and inspiration. Farewell. Outside of writing, I work at a University and have a very deep and ongoing commitment to education. As part of this, I have helped to develop resources for teaching (among other things) Computer Science and programming. One of my aims has been to provide these resources to other people as frames upon which they can build materials that speak to their culture, in their language. We recently ran a course that reached over 40,000 people, across 180 countries. But many countries in Africa were not heavily involved, because of some limitations of network access but also because of translation issues. English is not the only language of the world. Thus, I am excited to share this link with you from Jalada, a pan-African writers’ collective. This is a short story by Ngũgĩ wa Thiong’o, originally written in Kikuyu, and translated into many, many other languages used across Africa. In English, the story is called “The Upright Revolution: Or Why Humans Walk Upright.” I enjoyed both the story and how it is presented as many languages. I hope that you do, too. Jalada’s logo, used here to share their presence. The programme for Adelaide’s queer arts festival, Feast, has been released, and it’s worth taking a look to see what’s on this year. The festival is held in Light Square from 10 to 25 November. Jamie Jewell is back with a new show, Last Days on Earth. Jewell did a superb comic turn in La Chêvre Noir last year – even his knees were hilarious – but disappointed recently in the showtune melodrama, The Lonely Man, despite singing his heart out. Last Days on Earth is described as a “cosmic caper”, so let’s hope this is Jewell in better form. Young performer Annie Seigmann is back. Last year she managed an irreverent, feel-good performance of her own songs even on a slow Tuesday night. She’ll have her work cut out again this time, as she’s been given the 11 am slot for Picnic in the Park. Another repeat show is New Coat of Paint: The Songs of Tom Waits, which I recall as being perfectly entertaining at the time but not actually memorable. 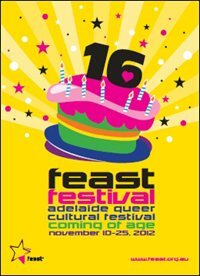 Feast Comedy Gayla should be worth a look. It will feature short taster performances from five comedians, including the acerbic, fishnet-wearing Hans. I usually find these compendium shows to be good value, as if any one performer is disappointing, there’s always another one on in a minute. Even better for the budget-conscious are the visual arts exhibitions, which are free. Last year they were held in shipping containers in Light Square, with a few works from each artist. Otherwise, well, there’s lots. Cabaret, music, films, comedy, drag, and community events. Bowling, bingo, and the release of a pig by an animal liberation group (what?). The burlesque boom is well represented, so let’s hope some of that is less dull that what I sat through during the Fringe. Boyleqsue and Ambrosia do boylesque, Shaken and Stirred do “grrrlesque”, Trixie and Monkey do striptease acrobatics and Bad Barber Shop Burlesque involves man-eating plants. Yes, that’s rainbow triffid burlesque. This intrepid reviewer may have to report back later. New reviews are always on the way. This week we’ll be looking at Aboriginal Art in Adelaide, some Mad Music in Melbourne and I will probably write even more about Penguins.